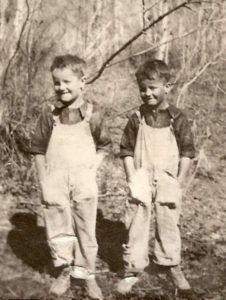 Twin brothers Ralph Henderson, left, and Boyd Henderson. Boyd and Ralph Henderson are twin brothers. They were born in Arimo, Idaho, on 6 September 1918, with Boyd born about two hours before Ralph. 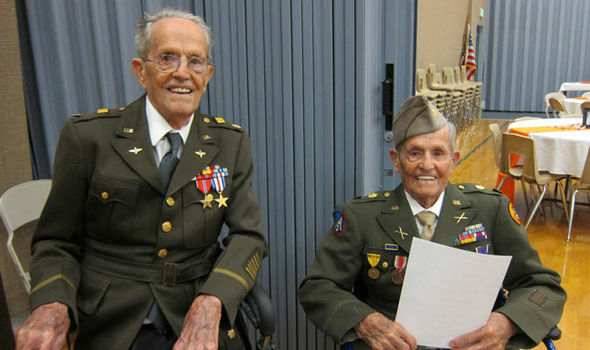 They are members of The Church of Jesus Christ of Latter-day Saints (often mistakenly referred to as the Mormon Church) and they are also World War II veterans. The stock market crash of 1929 led the family to Pocatello, where the twins grew up working side by side in the family feed store. In 1936, Boyd and Ralph graduated from Pocatello High School. 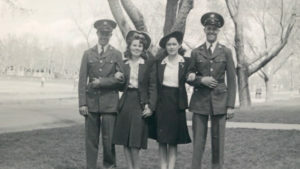 They attended a year of college and considered missionary service when the radio announced Ralph’s draft number in 1941. 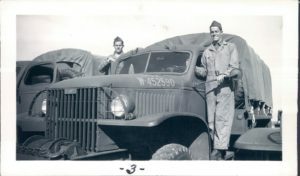 They decided to enlist in the National Guard and became a part of the 183rd Field Artillery Battalion. Before celebrating their centennial birthdays with family and friends in early October 2018, they shared some of the life lessons they have learned over a lifetime as members of the Church. They were asked what difference the gospel of Jesus Christ has made in their lives. They both agreed that it has made all the difference. 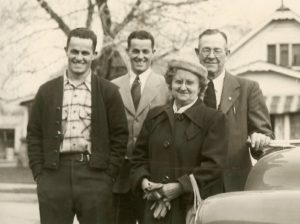 Boyd and Ralph, left, with their parents, Anna and Louis Edgar Henderson. The twins are also firm believers in observing the Church’s health code as outlined in Doctrine and Covenants 89. In a priesthood blessing given by their father before their service in World War II, they, along with two other brothers and one brother-in-law, were promised that if they observed the Word of Wisdom and obeyed God’s commandments, they would be protected and return home safely. They never forgot that promise, and all five returned home safely. 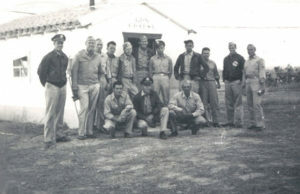 Ralph (standing on far left) and Boyd (2nd from right) in front of the chapel they built with help from other LDS soldiers. As a demonstration of their faith and devotion, the Henderson brothers sold some of their K rations and collected enough money to buy lumber and supplies to build, with the help of other Latter-day Saint soldiers, a small chapel for worship services on the island of Sardinia in the Mediterranean. Before being deployed overseas, both brothers married their sweethearts. While on a three-day leave, Boyd was sealed to Ethel Chilton in the Salt Lake Temple. When his convoy to the West Coast stopped to refuel in Pocatello, Ralph arranged to marry his high school sweetheart, Lena Rawlins, in less than four hours. During the war, Boyd and Ralph served in parts of North Africa and Europe and did their best to stay in touch with one another. They were among the first troops to enter Rome and returned home with a Nazi flag as a souvenir. Boyd Henderson served as a county commissioner, a stake president, and later as a mission president in Melbourne, Australia. Ralph’s wife, Lena, suffered a stroke that left her partially paralyzed. Ralph was her caretaker for 14 years up until the time of her death in 2001. A year later, he married LeNore Thompson Smedley. Boyd’s wife, Ethel, died in 2011. They also have a large posterity, including dozens of grandchildren and great-grandchildren. His daughter, Melanie Henderson Allen, helped to create a display showcasing her father’s life and was thrilled to see some of his missionaries visit with him at the party. She said, “I prayed they would be able to live and reach their 100th birthdays. He was so involved in serving others. He served God and kept the commandments. That was first in his life. … He’s a faithful guy. 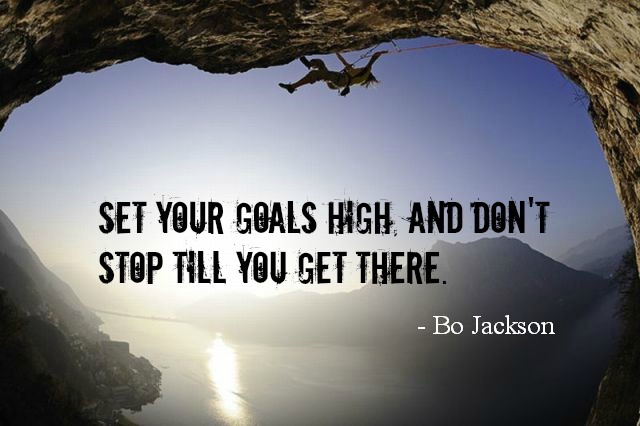 Boyd has lived a full and rich life. 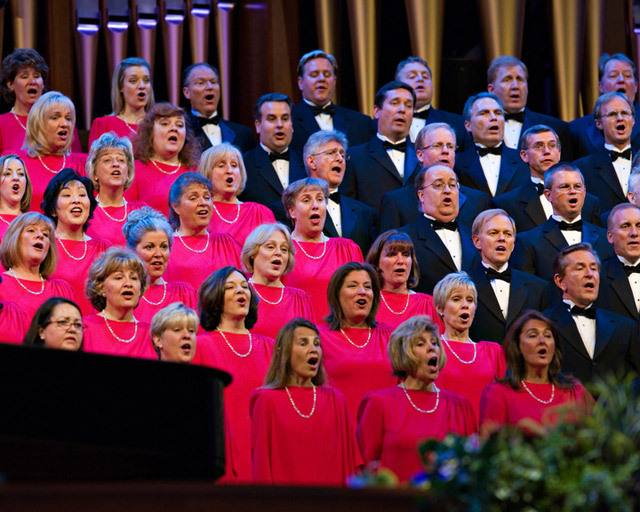 He is a patriot, has served as a church leader, has been a BYU football season ticket holder since the 1970s, and has a passion for water-skiing, although it has been a while since he has been able to do that. He is also an avid supporter of the Boy Scouts of America and received the Silver Beaver Award.